BriCal (after BRItish CALculator) is a circular brass calculator, patented (see the lower patent drawing) in 1905 by the engineer Herbert Dickinson and his wife Mabel Dickinson (British patent №GB190512088A). 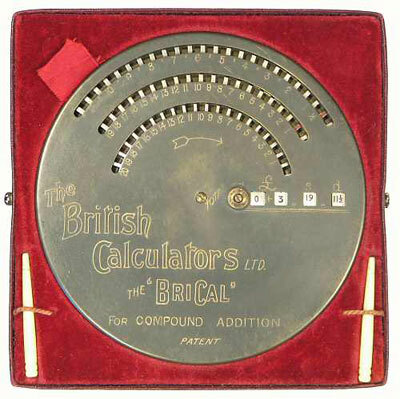 The machine was manufactured by the company British Calculators Ltd, London, from 1905 till 1920s in different variants. The most common device is a disk, with diameter 135 mm and 10 mm thick, weight 450 g, put in a special case with velvet. This particular machine has three or more concentric discs which are drawn clockwise with the stylus to add pounds, shillings, and pence. Using the pin or stylus, one rotates the chain, until the wanted sums show in the window. Sums can be calculated to £500.